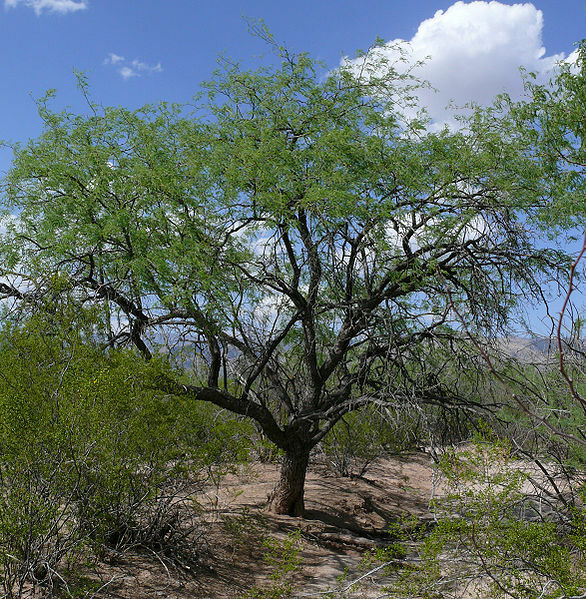 The tall stately velvet mesquite tree (Prosopis velutina) is not what most people think of as a herb! But this graceful tree with durable wood was used as a medicinal herb as well as a source of food, tools, and building materials. The velvet mesquite can grow into a lovely tree especially when given minimal pruning. Sore throats were treated with a hot tea blend of the clear sap plus inner red bark, while stomach aches were treated with a tea made from the leaves. Toothache was treated by chewing the root. For flagging appetite, a tea made from the leaves was taken before meals. Along with medicinal uses, the bark was used for baskets and fabrics, the wood used for tools, building and firewood, and perhaps most importantly, the pods are a protein-rich food. The clear mesquite sap (usabi in O’odham) is not only edible but a highly palatable treat, eaten right off the tree. It was often collected and saved, sealed in pottery vessels, and fed the ill (children especially) to help bolster flagging appetites. 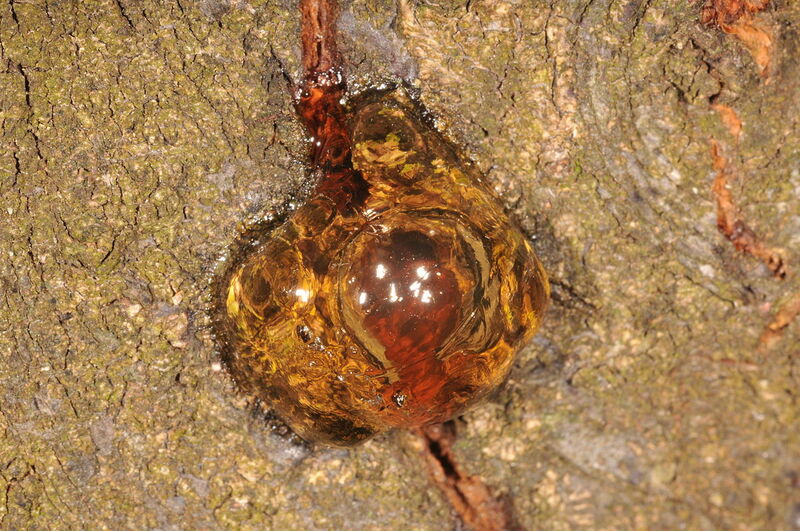 Mesquite trees can produce a clear-ish sap, like this cherry sap, that has a sweet flavor. Photo by T. Bresson. Mesquite seed pods (wihog in O’odham) were an important food source for the natives, and are becoming increasingly important today as research determines how healthful they are for humans. 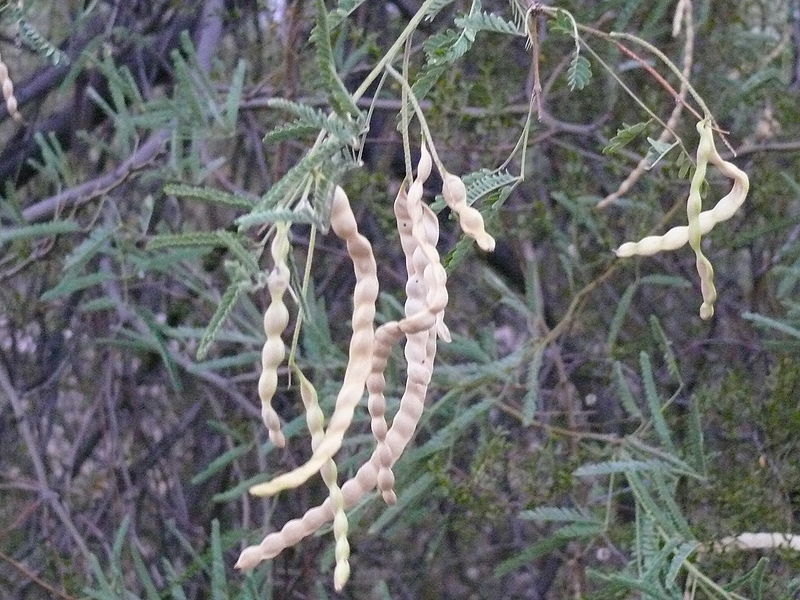 Mesquite pods, and their meal and flour, are considered a “slow release” food due to galactomannin gums which have been found to lower glycemic responses. Their glycemic index is 25 percent, compared to 60 for sweet corn, and 100 for white sugar. I believe some of my “Savor Sisters” will discuss this issue further. Today I am looking at the medicinal uses and how to grow this marvelous plant. Mesquite pods fresh off the tree are a tasty treat. Of vital importance to a select number of folks was the use of mesquite against hair loss. This treatment was used by men only, and consisted of the black sap that oozes from mesquite wounds (not the clear sap) mixed with other secret herbs and applied to the scalp. Mesquite herbal soap for “macho” hair is still available in parts of Mexico..
. 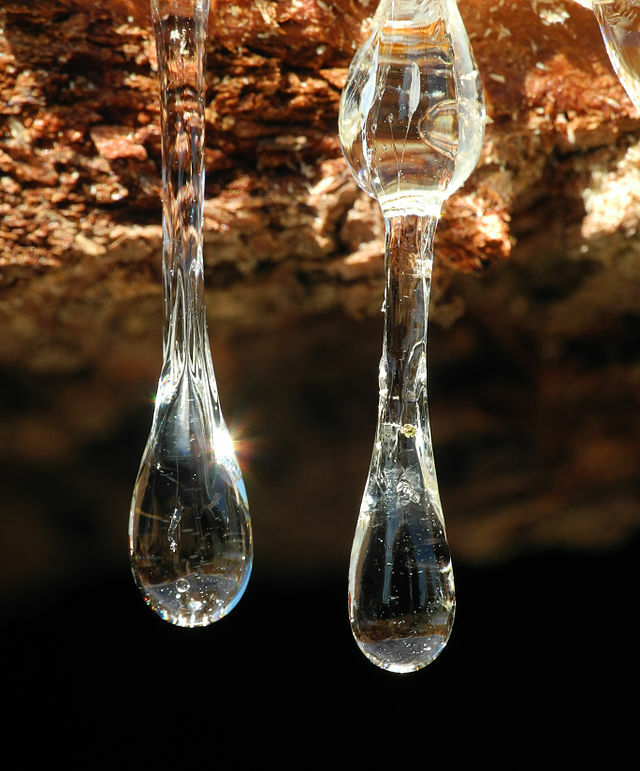 The dark sap that oozes from mesquite wood is said to be good against hair loss. Our Sonoran Desert native velvet mesquite is slower growing than the grassland mesquite species from Argentina and Chile, but it is a far better choice for a number of reasons. Unlike the non-natives, velvet mesquite is well adapted to our climate, and it feeds the native animals. Leaves serve native butterfly larvae and Gambel’s quail. 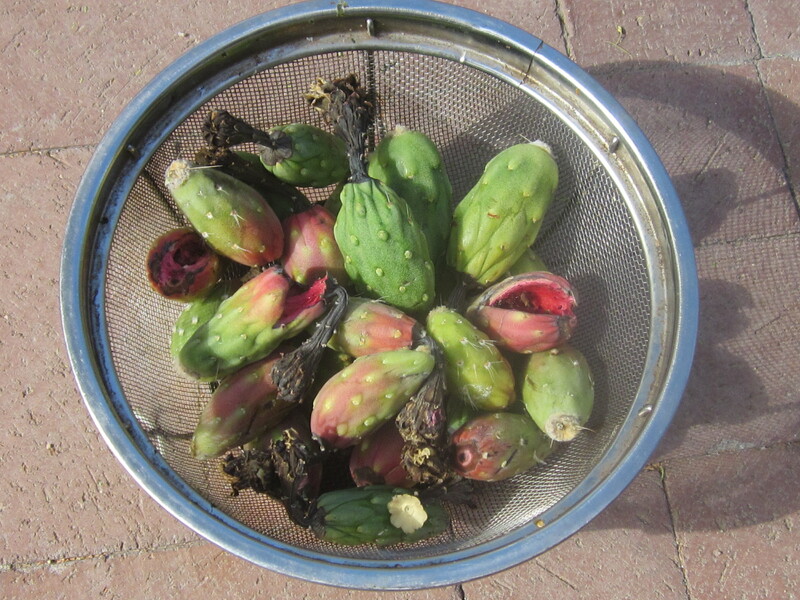 The pods nourish almost every Sonoran Desert inhabitant, from bunnies and squirrels to coyotes, javalina and humans. The velvet mesquite also has deep tap roots, making it much less likely than the non-natives to blow over in the swirling summer winds that often accompany the monsoon rains. Since all mesquites can cross, it is now difficult to find pure velvet mesquite. If you go far from town you may get a pure species. 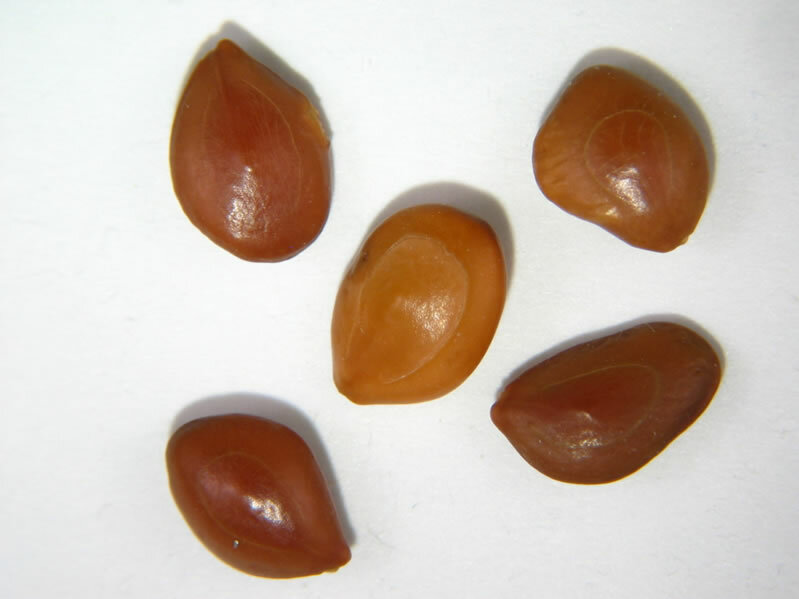 Harvest a handful of seed pods, then plant them, pods and all, where you want your tree to grow. Water well and stand back. When about twenty little seedlings have several clusters of true leaves, select the one or two with the most velvety blue leaves. Keep watering but do not fertilize. We started a tree this way and in three short years it grew to a sturdy and robust 20 foot tall tree. In the same time frame, mesquite trees we planted from 15 gallon containers were scarcely any taller than when they were planted –about seven feet tall. 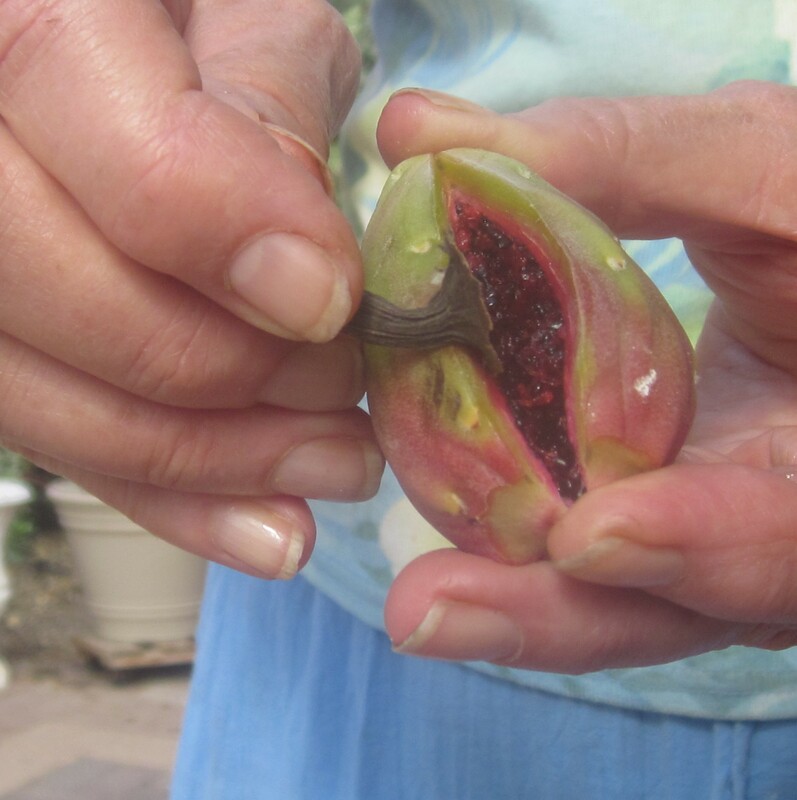 No need to remove the seeds from the pod prior to planting. Just put them into the soil, pod and all and keep evenly moist. Mesquite are drought toleratant once they are established, but they grow more quickly and larger with a thorough soaking of root zone once every month or two during the warm months. 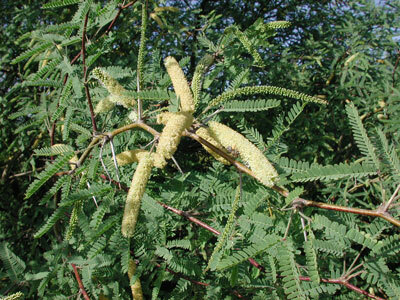 Do not fertilize mesquite trees or any plant in the pea family. They have a special relationship with bacteria that fix nitrogen out of the soil atmosphere. If you want to encourage more rapid growth of your mesquite, mulch it with an organic mulch, such as the leaves that have dropped off it or composted organic material from a nursery. This article copyright Jacqueline A. Soule, 2014. The topic is covered more extensively in my book “Father Kino’s Herbs: Growing and Using Them Today” (2011, Tierra del Sol Press, $15). If you live in Tucson, I hope you will consider purchasing a copy locally at Antigone Books, Arizona Experience Store, Magic Garden, Mostly Books, or Rillito Nursery. 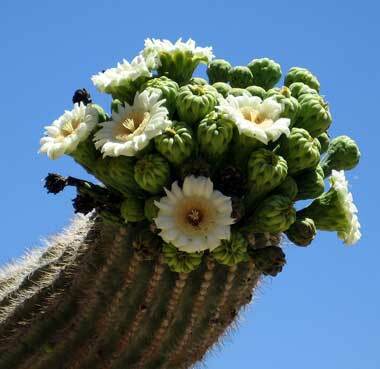 Saguaro flowers and unripe fruit. Photo by Rael B. Our fire has burned and the sun has gone down. Come together, following our ancient custom. This was the song that called the people of the Tohono O’odham villages together for the saguaro wine ceremony that followed the harvest. During the ceremony, they people invoked the intercession of a deity far away in a “rainhouse” full of wind, water and seeds in the hopes of hastening the storms. This and many other songs were collected and translated by Ruth Murray Underhill, an early anthropologist who lived among what were then called the Papago in 1938. They appear in her book Singing for Power. 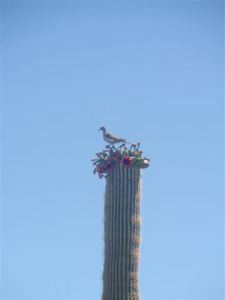 The orginal desert dwellers used a dead saguaro rib to push the fruits off the cactus. If you can’t find one, any long pole or a fruit picker will do. You can separate the fruit from the rind in the field or bring it home to clean. Each fruit comes with its own sharp-edged knife, like a natural can opener. 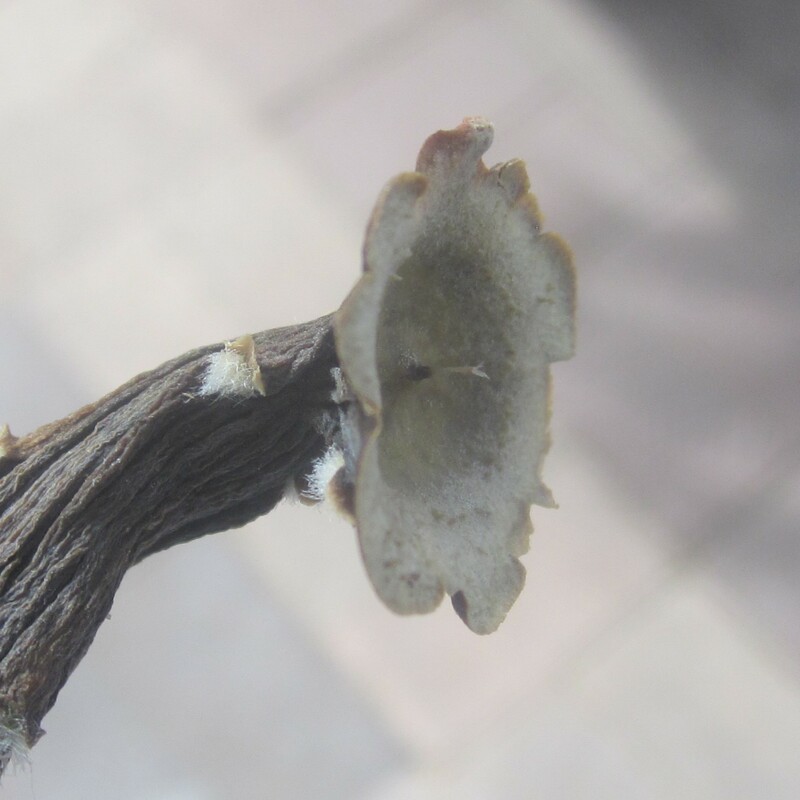 Opening a fruit with the calyx on the blossom end. Sharp edge of the calyx can be used as a knife. Once you have extracted the fruit, you can either dry it whole or separate it into the seeds and juice. This is a simple process. To your pan or bucket, add as much water as you have fruit. Let it sit, covered loosely for six to eight hours. Then plunge your hands in and break up the fruit. Strain off the juice. Boil to concentrate. If you want to make syrup from the concentrated juice, add half as much sugar as you have juice and boil until clear. Store in a clean glass jar in the refrigerator. It will usually keep for months. So what are the options for the seeds. You can put them in any baked good, make pilaf or porridge or cookie filling. But an easy use is homemade crackers. Spread the wet seeds on a cookie sheet in the sun. There will be some white material left from the juice, but either blow it off or ignore it. I made these crackers in around a half hour. We are accustomed to eating commercial crackers that are very sweet and salty. So if you want a familiar flavor, use the higher amounts of salt and sugar. Preheat oven to 400 degrees. 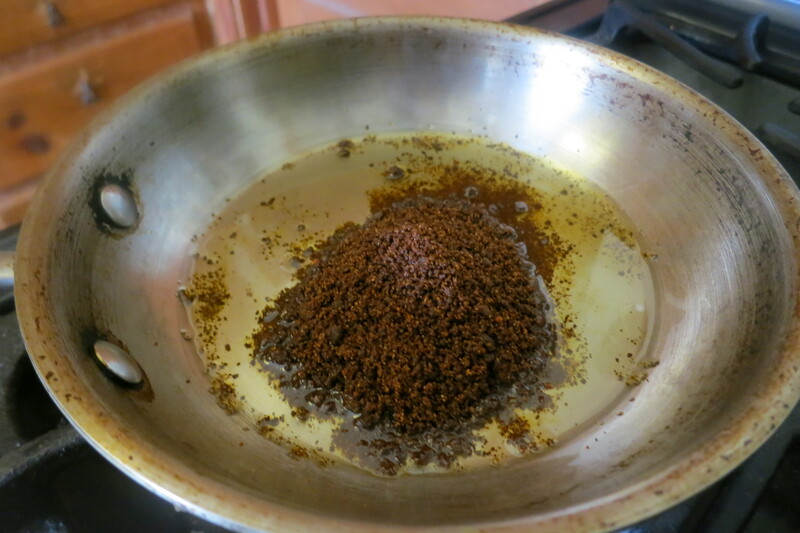 Grind the 1/4 cup saguaro seeds in a blender or coffee grinder. In a large bowl, combine seeds, flour, baking powder, salt and sugar. Add water, vinegar and oil and mix, stirring and kneading until a stiff dough forms. Shape dough into two rolls, 6 inches long and 1 inch in diameter. Then slice each roll into eight wafers. 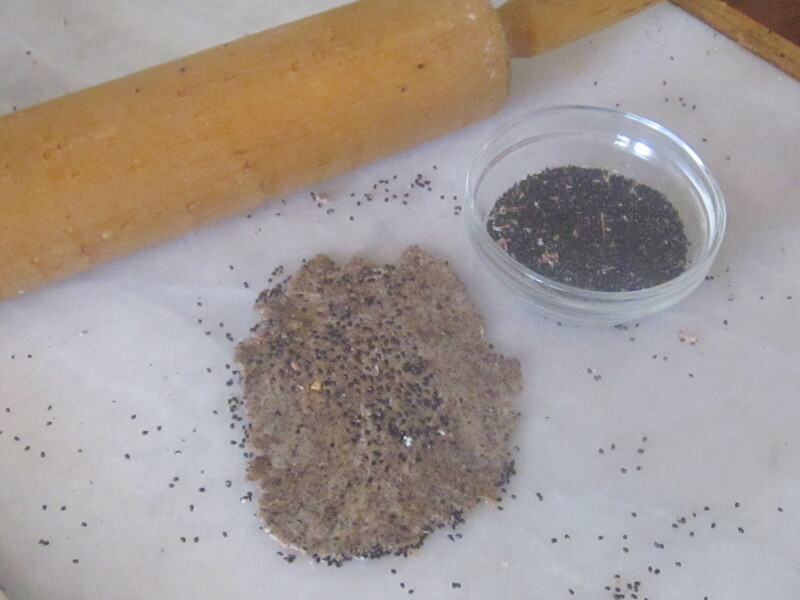 Sprinkle some seeds on a flat surface, place one disk of dough on it, sprinkle some more seeds on top and roll with a rolling pin as thinly as you can. The thinner the cracker, the crisper they will be. The shapes will be irregular. Form dough into log and divide into eight portions. Roll out each portion of dough. Transfer the crackers to an ungreased nonstick cookie sheet. If you have a regular metal pan, use a sheet of parchment paper. Bake in the preheated oven for just 5 to 7 minutes. Watch closely to ensure they do not burn. You can serve with soup or salad. Or spread with a soft cheese. 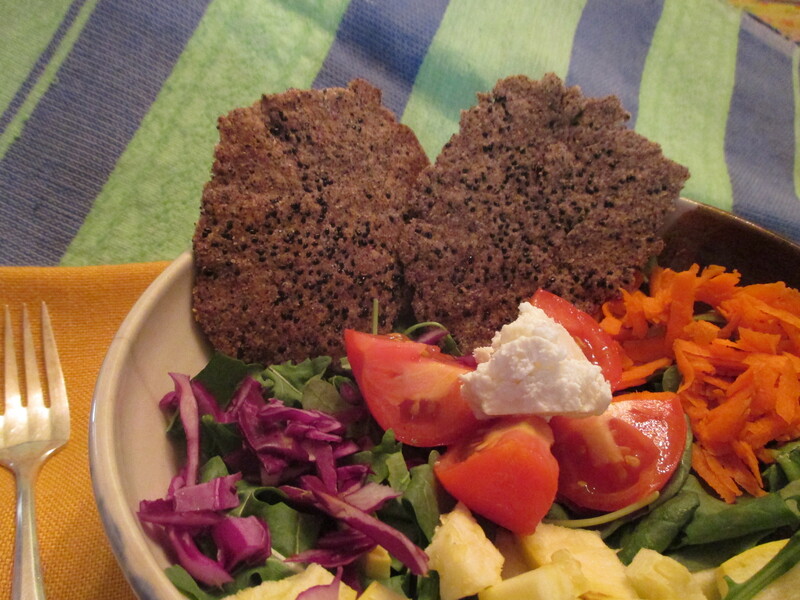 Serve your Black Beauty Wafers with a crisp salad. 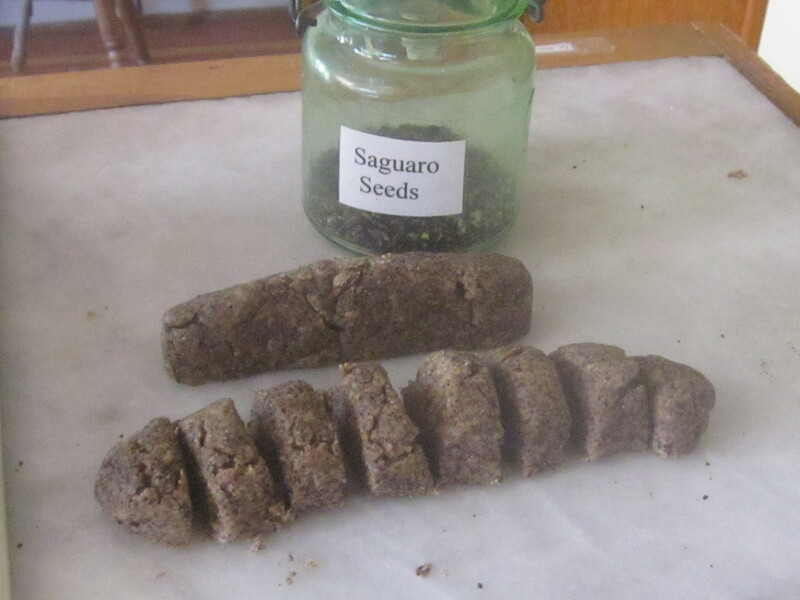 For more recipes using both saguaro fruit and seeds, consult Cooking the Wild Southwest: Delicious Recipes for Desert Plants. You can find a copy at Native Seeds SEARCH or order online here. 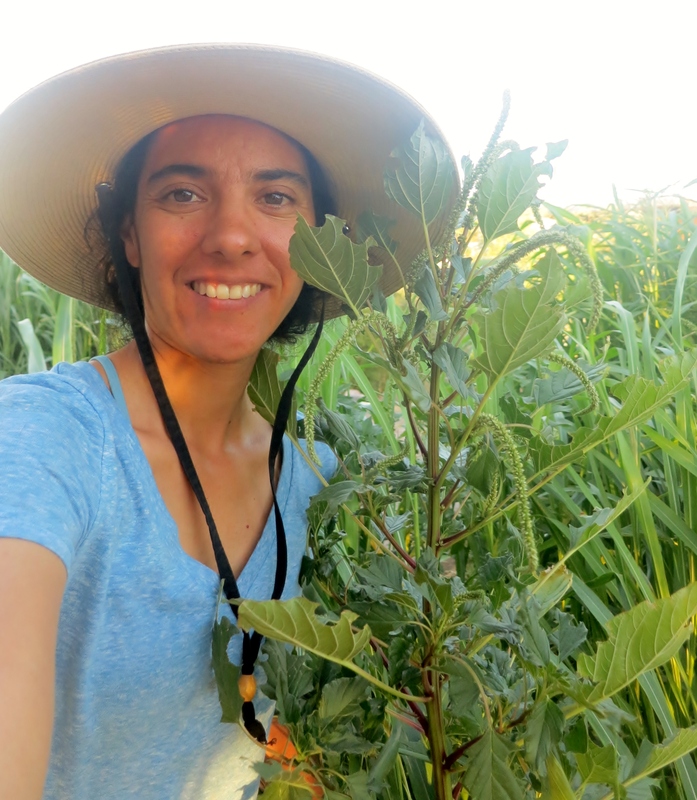 Hello, this is Amy Valdés Schwem, and I’m honored to be here with such esteemed plant and cooking women! I love harvesting wild greens, but my day job is making mole as Mano Y Metate. 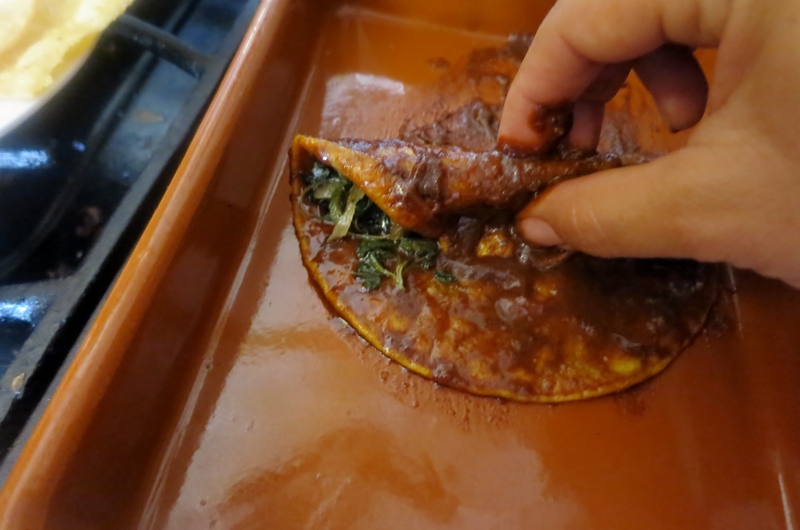 Today I’m going to make enchiladas made with Mole Dulce and fill them with wild greens and summer squash. It won’t heat up the house, if you take the toaster oven outside! 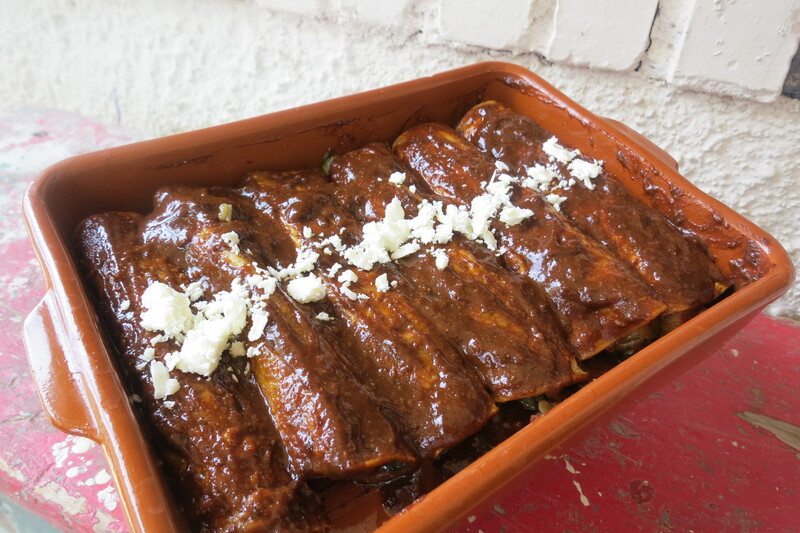 Enchiladas made with tomato sauce instead of chile are called entomatados, and those made with mole are enmoladas. So the menu can read: Enmoladas de Mole Dulce con Quelites y Calabacitas. 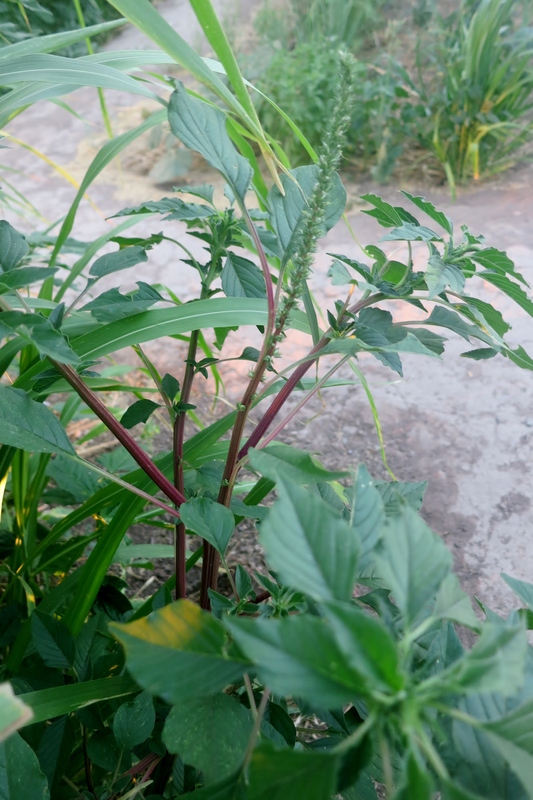 Quelites can refer to several unrelated wild greens, but to me they are wild amaranth greens, Amaranthus palmeri, also known as pigweed. I grew up eating quelites with my maternal grandfather, and he knew no shame jumping fences to pick weeds. They make a few tiny black seeds, unlike its Mexican domesticated relatives that make enough blond seed to fill bulk bins at the health food store. 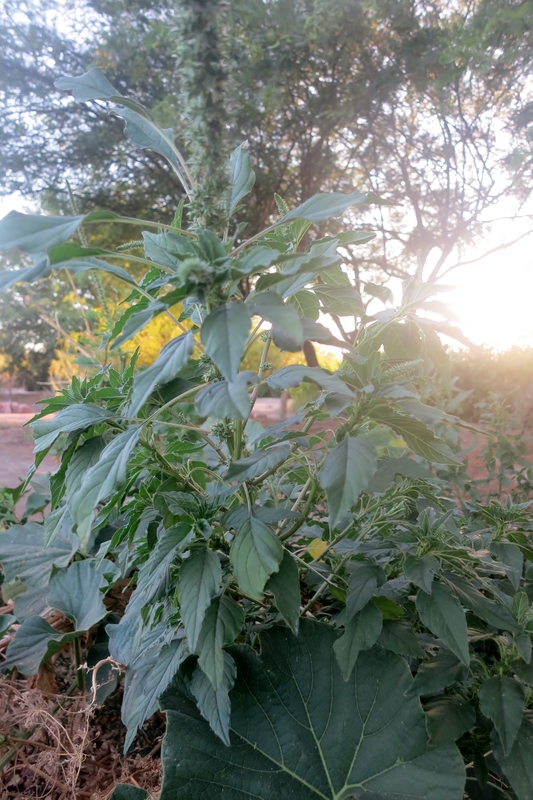 It is native to the southwest US and northwest Mexico, and its wild and domesticated relatives are enjoyed around the world both as a green and for its grain-like seed. 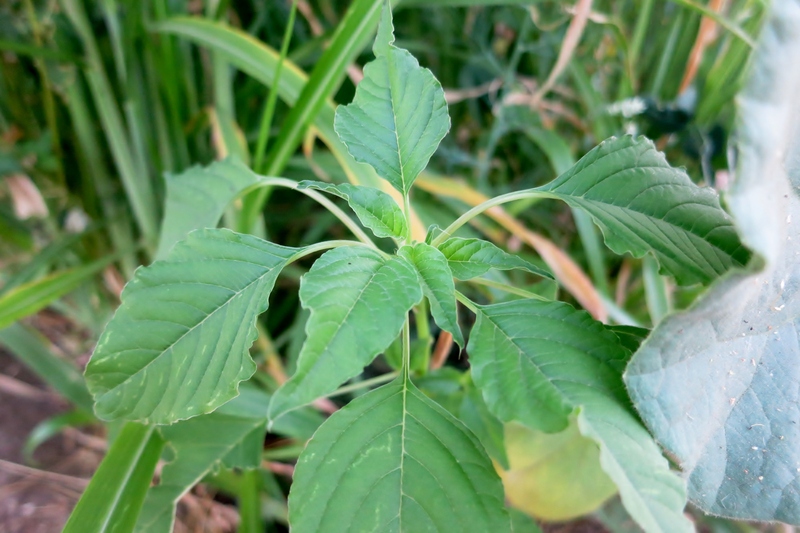 It easily out-competes summer garden and field crops and is becoming resistant to glyposphate (Roundup). But you wouldn’t want to harvest from those over fertilized fields anyway, since it can absorb too much nitrate, making it unsafe for humans and animals. However, grown in native desert soil, they are safe and nutritious, high in vitamin A, vitamin C, and folate, among other vitamins and valuable minerals. Some species and cultivars available at Native Seeds/SEARCH are used for dye and have red leaves, and some make a huge red inflorescence pretty enough to grow as an ornamental, even if the birds eat all the seed. I’ve never had much luck popping the seed I grew, but you can buy commercially popped seed, like miniature popped corn. I just visited my closest community garden, Las Milpitas de Cottonwood, and found these beauties in the irrigated beds already in flower. If this was all I had, I would pick the smallest leaves from the stalks and use those. Hopefully you find quelites before flowering, shorter than a foot tall. I found a few plants in my yard where other things get watered. Many more will sprout with the summer rains. Last year I had so many from my Tucson Community Supported Agriculture share that I dried some, just like my great aunt Tia Lucy told me they used to do. I just plucked leaves from the stems and air dried them in the house. To use, I soaked in water overnight, then sauteed with the others. I’ll dry more this summer, for sure. 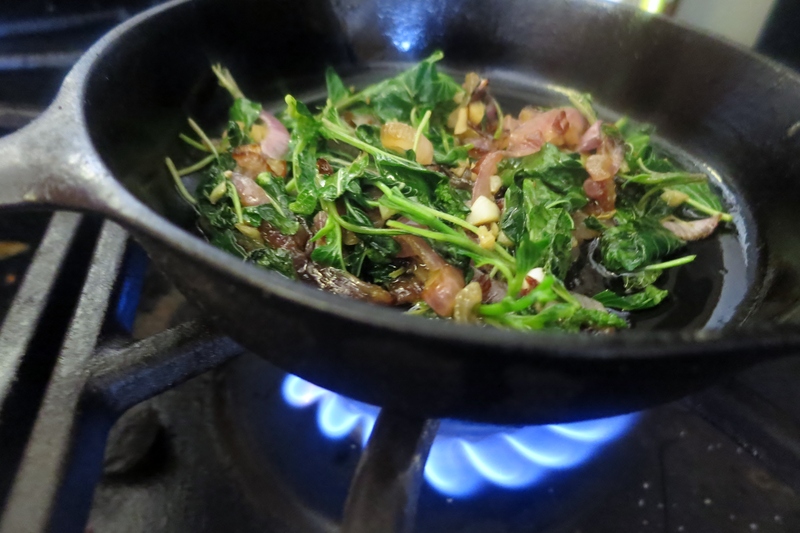 To prepare the fresh quelites, wash, chop tender stems and all, and saute with a little onion and garlic in oil. My grandfather always used bacon grease, so that’s what I did. It’s also prime season for calabacitas, so use them if you don’t have any fresh or dried quelites. My grandfather also collected and cooked verdolagas for us, which would work here, too. Calabacitas, sauteed with onion and garlic. 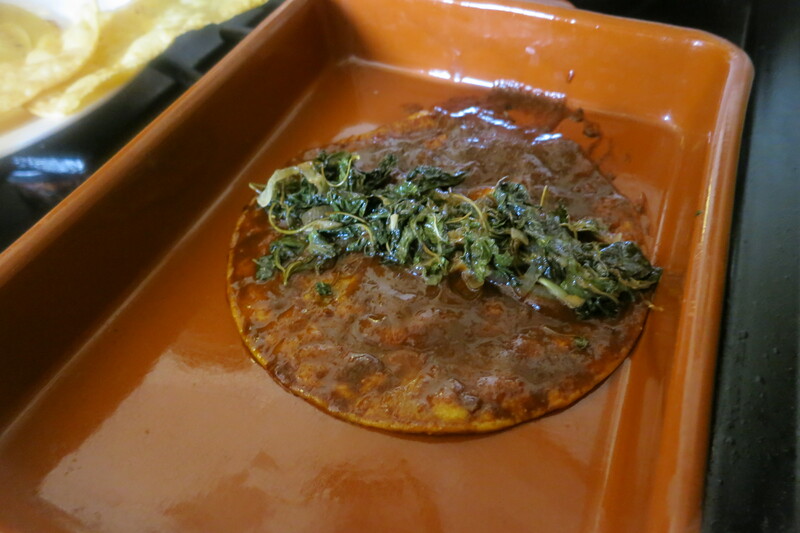 This filling with mushrooms and queso fresco, inside mole dulce enchiladas, is my brother’s signature dish. Well, one of his signature dishes. Now for the mole! 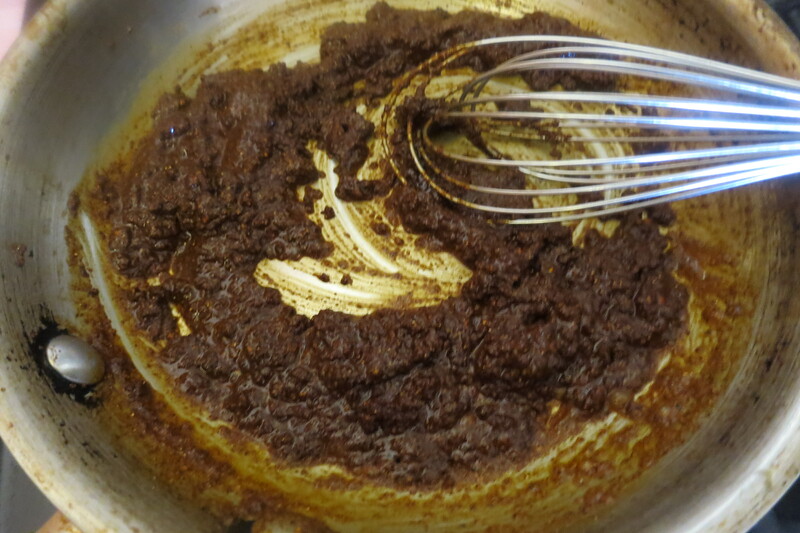 For a half dozen enchiladas, to serve two people, I used about half of a tin of Mano Y Metate Mole Dulce powder, cooked in mild olive oil to make paste. Then I added about half a cup homemade chicken stock and a dash of salt, but veggie stock is great, too. Water doesn’t quite do it. 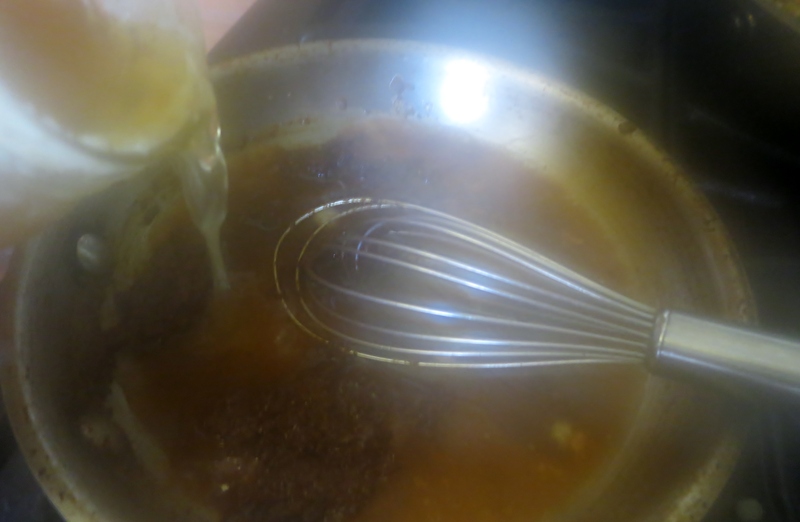 Simmer until you have a nice sauce, adding more broth as necessary. There will be steam and good smells. 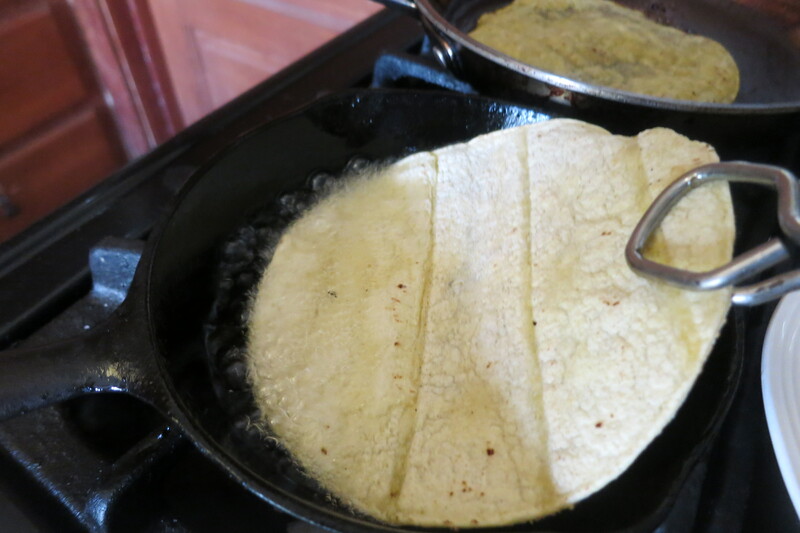 The secret to enchiladas: start with thin corn tortillas and fry briefly in oil hot enough to sizzle, but not hot enough to make them crispy!!! DO NOT skip this step! If the tortilla cooks too much, or if it breaks, just turn up the heat and make that one into a corn chip. 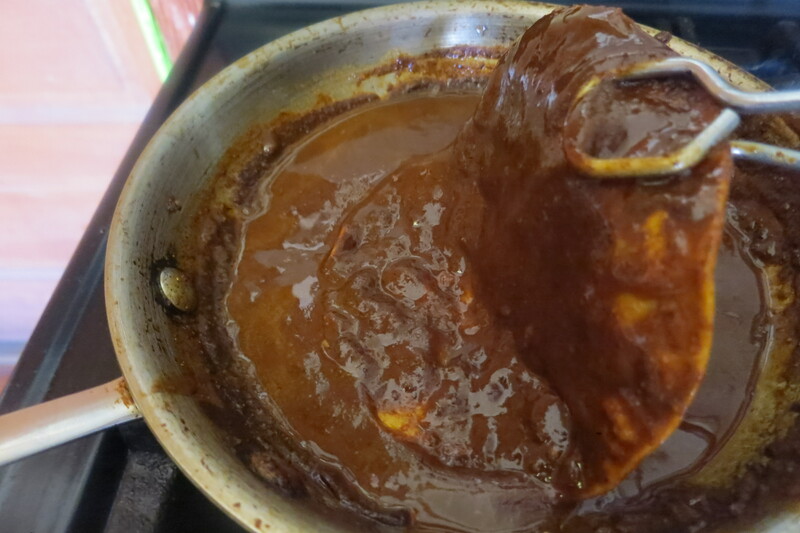 Dip the flexible tortilla in the mole dulce. Put quelites or calabacitas in the tortilla and roll. Top with homemade queso fresco and bake until heated though. My grandfather used the toaster oven outside on the patio in the summer to make enchiladas. No need to heat the house! Depending on your oven, you may need to cover them with foil, but I didn’t. I like crispy edges. 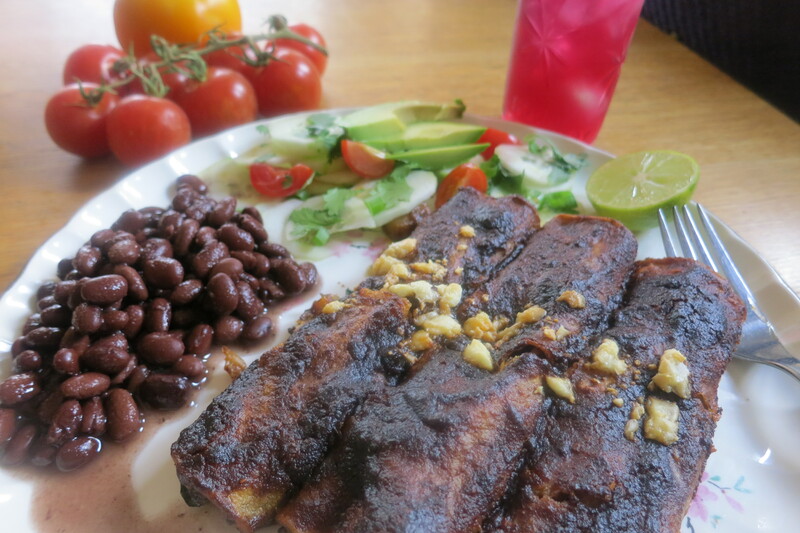 Serve with a cucumber, tomato salad dressed with a squeeze of lime, beans, and prickly pear grapefruit-ade. Leftovers are best fried in a cast iron pan until crispy. Mano Y Metate moles can be purchased from Martha Burgess of Flor de Mayo Arts at the Sunday Heirloom Farmers’ Market at St. Philip’s Plaza, Native Seeds/SEARCH, and ManoYMetate.com.